The above map shows the split between the jurisdictions on the duty in take-home asbestos exposure cases. While the majority of the states have not specifically addressed the issue in the asbestos exposure context, of those that have, most have held that there is no duty. 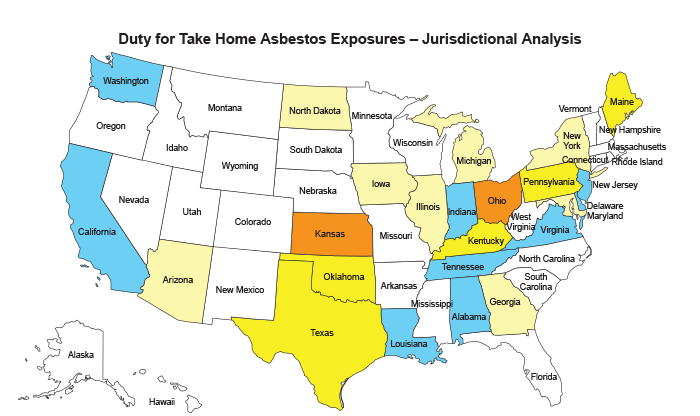 The courts that have ruled there is no duty to warn household members of the dangers of “take-home” asbestos exposures have done so based on a lack of foreseeability, often examining the state of the knowledge during the years of the alleged exposures, and/or based on a lack of relationship between the parties. However, nine jurisdictions have held that a duty exists. Take-home exposure cases, also called secondary, bystander, or non-occupational exposure, are anticipated to increase over the coming years and prolong asbestos litigation that has generated hundreds of thousands of claims. The allegations generally pertain to a spouse or parent who worked with or around asbestos-containing products, who unintentionally brought the asbestos fibers into the household. Laundering of the work clothes, exposures in the family vehicles, or personal contact are usually involved in transmitting the alleged exposures. The summaries below discuss the major decisions and laws addressing take-home asbestos exposure. Bobo v. TVA , 2015 U.S. Dist. LEXIS 130741 (N.D. Ala. Sept. 29, 2015). Mrs. Bobo alleged exposure to asbestos from laundering her husband’s work clothes from his work at the Tennessee Valley Authority (TVA) nuclear plant at Browns Ferry, Ala., from the mid-‘70s to the mid-‘90s. She also alleged exposures to asbestos from her father’s work with friction products on farm tractors, and her husband’s work with asbestos at another employment. The court certified two questions to the Alabama Supreme Court as to 1) whether a premises owner has a duty to protect the family members of persons who work on the property owner’s premises from secondary exposure to a toxic agent, such as asbestos, used during the course of the property owner’s business; and 2) what causation standard applies when multiple exposures to a toxic agent, such as asbestos, combine to produce the plaintiff’s injury. The Alabama Supreme Court declined to hear those certified questions. The trial court then held that the premises owner (the TVA), owed a duty to the family members, and emphasized that the primary factor in the duty analysis is foreseeability under Alabama law. The court stated that decedent’s asbestos exposure was foreseeable in light of the existence of OSHA regulations and defendant’s own workplace standards, especially those aimed at preventing asbestos fibers from clinging to employee’s skin, hair, or clothing and being carried off defendant’s property. Policy considerations further supported the court’s decision, particularly in light of the low-cost methods of preventing secondary asbestos exposure. In April 2017 the 11th Circuit affirmed the U.S. District Court’s decision and held that Alabama courts would impose a duty of care on employers like TVA to prevent take-home asbestos where a plaintiff’s injury is foreseeable, and public policy considerations also weigh in favor of there being a duty. The federal appellate court stated that the TVA had acted affirmatively by using asbestos-containing products, failing to prevent take-home asbestos exposure, and knew of the risk of injury from asbestos being taken home on employees’ clothes. The court also held that the public policy concerns weighed in favor of imposing a duty on TVA in this case. Bobo v. TVA, 2017 U.S. App. LEXIS 7364 (11th Cir. Apr. 26, 2017). Kesner v. Super. Court , Nos. S219534, S219919, 2016 Cal. LEXIS 9431 (Dec. 1, 2016) – The California Supreme Court held in two consolidated cases,Kesner v. Superior Court (S219534) and Haver v. BNSF Ry. Co. (S219919), that “the duty of employers and premises owners to exercise ordinary care in their use of asbestos includes preventing exposure to asbestos carried by the bodies and clothing of on-site workers” where it is “reasonably foreseeable” that workers “will act as vectors carrying asbestos from the premises to household members.” The court additionally held that such a duty “extends only to members of a worker’s household.” In Kesner, a man alleged his mesothelioma was caused by exposure to asbestos dust transferred from his uncle’s soiled work clothes, who worked at a plant in the 1970s and was allegedly exposed to asbestos fibers released in the manufacture of brake shoes. In Haver, the wife of a former railway employee alleged her mesothelioma was caused by exposure to asbestos from her husband’s soiled work clothes. The husband worked as a fireman and hostler for the railway company in the 1970s and was allegedly exposed to asbestos from pipe insulation and other products. The cases were premised on two separate negligence theories: Kesner alleged negligence in the manufacture of brake products, and Haver alleged negligence under premises liability. The California Supreme Court determined that both theories implicated “the general duty to take ordinary care in the conduct of one’s activities,” and were, therefore, viable where the secondary harm from exposure to asbestos was reasonably foreseeable. The court determined that the harm was foreseeable – the “predominant factor” in the state’s duty analysis – because a “reasonably thoughtful person making industrial use of asbestos during the time periods at issue in this case (i.e. the mid-1970s) would take into account the possibility that asbestos fibers could become attached to an employee’s clothing or person, travel to that employee’s home, and thereby reach other persons who lived in the home.” The court concluded the duty existed, in part, due to the federal regulations and standards of the time (e.g. 1972 OSHA Standard) warning of the hazards associated with asbestos products. Stegemoller v. AC&S, Inc ., 767 N.E.2d 974 (Ind. 2002) – Under Indiana Product Liability Act, Ind. Code Ann. § 34-20-1-1 “consumer” includes “any bystander injured by the product who would reasonably be expected to be in the vicinity of the product during its reasonably expected use,” and the such use of “asbestos products encompasses the cleansing of asbestos residue from one’s person and clothing at the end of the workday.” Therefore dismissal of insulator’s wife’s claim was reversed and reinstated. Francis v. Union Carbide Corp ., 116 So. 3d 858 (La. Ct. App. 2013). The appellate court reversed a summary judgment ruling holding that there was evidence Mr. Rendon, who had mesothelioma, was exposed to asbestos from his father’s work clothes from working at the Pendleton Shipyard from 1943 to 1945. Chaisson v. Avondale Indus., Inc. , 947 So. 2d 171 (La. Ct. App. 2006). The appellate court upheld the trial court's determination that the employer owed a duty to the wife of an employee, who worked at shipyard from 1963 to 1976 and 1982 to 1986, for her asbestos-related injuries. The court considered the 1972 OSHA standards regarding the hazards of household exposure to asbestos, and the moral, social and economic factors in holding a duty existed. Zimko v. American Cyanamid, 905 So. 2d 465 (La. Ct. App. 2005). Decedent wife, who died of mesothelioma, claimed exposure to asbestos from her husband’s work clothes, who worked at a sugar refinery from 1977 to 2001. The court found the employer had a general duty to act reasonably in view of the foreseeable risks of danger to household members of its employees resulting from exposure to asbestos fibers carried home on its employee’s clothing, person or personal effects. Olivo v. Owens-Ill., Inc. , 895 A.2d 1143 (N.J. 2006). The New Jersey Supreme Court held that the defendant land owner had a duty to the spouses of workers based on the foreseeable risk of exposure to asbestos. Plaintiff Anthony Olivo had worked as a steamfitter/welder for several independent contractors at various sites in New Jersey over the course of more than 35 years, including Exxon Mobil’s refinery in Paulsboro, N.J. Plaintiff alleged that his deceased wife, who died of mesothelioma, was exposed to asbestos brought home on his work clothes. The court held that, “to the extent Exxon Mobil owed a duty to workers on its premises for the foreseeable risk of exposure to friable asbestos and asbestos dust, similarly, Exxon Mobil owed a duty to spouses handling the workers’ unprotected work clothing based on the foreseeable risk of exposure from asbestos [brought] home on contaminated clothing.” The court made it clear that any duty owed to a spouse is derivative, therefore, if no duty was owed to the husband-worker, then no duty was owed to the spouse. Satterfield v. Breeding Insulation Co ., 266 S.W.3d 347 (Tenn. 2008). The estate of a woman who died from mesothelioma at the age of 25, alleged she was exposed to asbestos from her father’s work clothes from his employment at an Alcoa Aluminum plant from 1978 to 1984. The Tennessee Supreme Court held that a duty of reasonable care arises whenever a defendant’s conduct poses an unreasonable and foreseeable risk of harm, and that the relationship analysis is misplaced under Tennessee tort law. The court found the employer was aware of the high volumes of asbestos on its employees’ clothes and that exposure to asbestos created a substantial health risk. The court held the alleged risk was foreseeable, and affirmed the appellate court’s reversal of the judgment on the pleadings. Quisenberry v. Huntington Ingalls Inc., No. 171494, 2018 Va. LEXIS 137 (Va. Oct. 11, 2018). In a certified question of law from the U.S. District Court for the Eastern District of Virginia, the Virginia Supreme Court ruled in a 4-3 decision that an employer owes a duty of care to an employee's family member for take home exposures to asbestos. The facts alleged were from 1942 to 1977 Ms. Quisenberry lived with her father and in 1954 began laundering his work clothes that exposed her to asbestos from his employment at the Newport News Shipbuilding and Dry Dock, now Huntington Ingalls Inc. In 2013 she was diagnosed with pleural mesothelioma. The Virginia high court held that there is a duty when there is "sufficient relation to place plaintiff within reach of defendant's conduct." The duty is owed to "such persons in the recognizable and foreseeable are of risk." Rochon v. Saberhagen Holdings, Inc., 2007 Wash. App. LEXIS 2392 (Wash. App. 2007). Mrs. Rochon had alleged asbestos exposure from laundering her husband’s work clothes caused her mesothelioma. Her husband worked for Scott Paper Co., (predecessor to Kimberly-Clark), from 1956 to 1966. The trial court held no duty of care was owed to Mrs. Rochon, but the appellate court reversed holding that Kimberly-Clark had a duty to prevent her injury if its use of asbestos was unreasonably risky and her injury was foreseeable. Quiroz v. Alcoa, 2016 Ariz. App. LEXIS 218 (Ariz. Ct. App. Sept. 20, 2016). Dr. Ernest V. Quiroz, who died of mesothelioma, was allegedly exposed to asbestos from his father’s clothes who worked at Reynolds Metal Co. in the 1950s and 1960s. Having reviewed the policy considerations including, the potential liability to anyone who ever came in contact with an employee, the court held that the drawbacks of recognizing a duty of care in take-home exposure cases outweigh any potential benefits. The court also held that Reynolds owed no duty of care after examining the foreseeability of harm. Martin v. Cincinnati Gas & Elec. Co ., 561 F.3d 439 (6th Cir. 2009). Mr. Martin alleged exposure to asbestos from 1952 to 1963 from his father’s clothing who worked for Cincinnati Gas & Electric (CG&E) with asbestos products. After analyzing the information that was available to CG&E in the 1950s, the Sixth Circuit ruled that under Kentucky law there was no duty based on secondary exposure to asbestos because defendants could not have known of the risk of secondary exposure. Dube v. Pittsburgh-Corning Corp ., 1988 U.S. Dist. LEXIS 5739 (D. Me. Mar. 27, 1989) – Four asbestos product manufacturers sought contribution from the federal government for settled claims paid to a Portsmouth Naval Shipyard employee’s daughter who died of mesothelioma in 1984. She had alleged exposure to asbestos from her father’s person and clothing from the age of 9 in 1959 until she left the family home in 1973. Her father had worked as an insulator or pipe coverer at the naval shipyard. The court held that under Maine law the United States was not negligent for any exposures prior to 1964 because there was no evidence in the case that prior to research released in October 1964 that the public was aware that secondary exposure to asbestos from dust on clothing presented a risk of disease to domestic bystanders. The court then held that the United States was one-third responsible for the post-1964 exposures, but the discretionary function exception protected the United States from liability. Rohrbaugh v. Owens-Corning Fiberglas Corp ., 965 F.2d 844 (10th Cir. 1992). The representatives of the estate of an insulator’s wife, who died of mesothelioma, alleged exposure to asbestos from insulation products the husband brought home on his work clothes during the 1960s. Applying Oklahoma law, the 10th Circuit held that the insulation manufacturers did not have a duty to warn because they could not foresee that household members would be affected by their products, and there was no evidence that in the 1960s it was known to them that amosite or chrysotile asbestos fibers could cause mesothelioma. The trial court had erred in its jury instructions that imposed a duty to warn the decedent of asbestos exposure risks. Hudson v. Bethlehem Steel Corp ., No. 1991-C-2078, 1995 WL 17778064 (Pa. Ct. C.P. Dec. 12, 1995). Mrs. Hudson died of mesothelioma in 1991 and representatives of her estate alleged she was exposed to asbestos from washing her father’s clothes for about 20 years from about 1940 to 1960, who worked at Bethlehem Steel. The court held Bethlehem Steel did not have a duty to Mrs. Hudson "[b]ecause Bethlehem Steel could not have foreseen that [she] would be exposed to the asbestos fibers … ."). Alcoa, Inc. v. Behringer , 235 S.W.3d 456 (Tex. Ct. App. 2007). The appellate court reversed a $12 million actual damages, and $2 million exemplary damages jury award for the wife of a worker at an Alcoa plant for four years in the mid-1950s. The appellate court held Alcoa did not owe Mrs. Behringer a duty because the danger of non-occupational exposure to asbestos dust on workers clothing was neither known nor reasonably foreseeable to Alcoa in the 1950s. Quiroz v. Alcoa, Inc., 416 P.3d 824 (Ariz.2018). Dr. Ernest V. Quiroz, who died of mesothelioma, was allegedly exposed to asbestos from his father's clothes who worked at Reynolds Metal Co. in the 1950s and 1960s. The Arizona Supreme Court held that Alcoa owed no duty to Mr. Quiroz because there was no special relationship (no employer-employee, no landowner-invitee, no landowner-licensee relationship), and he was not injured on Defendant's property. The Court also analyzed foreseeability, however Arizona law rejects foreseeability as a factor in determining duty. The Court wrote: It would be "'simpler' if everyone owed a legal duty of care to all people all the time,...but [l]ife will have to be made over, and human nature transformed' before such a duty could 'be accepted as the norm of conduct.'" Quoting Palsfraf v. Long Island R. Co., 162 N.E. 99, 100 (N.Y. 1928) Id., at 843. Simpkins v. CSX Transp., Inc ., 965 N.E.2d 1092 (Ill. 2012). Representatives of Mrs. Simpkins, who died from mesothelioma, alleged exposure from asbestos on her husband’s clothing who had worked for CSX Transportation from 1958 to 1964. The Illinois Supreme Court considered relationship the “touchstone” of the duty analysis. Foreseeability is an integral factor to the existence of duty, the court wrote, and because the complaint failed to detail the specific facts supporting the foreseeability question, the court remanded the matter with directions to file an amended complaint. Further, in Illinois appellate court decisions, the court concluded that there was no duty because the defendant had no legal relationship with the victim of secondhand asbestos (Estate of Holmes v. Pneumo Abex, L.L.C., 955 N.E.2d 1173, 1178 (Ill. App. Ct. 2011)); and that the defendant owed no duty for lack of a legal relationship (Nelson v. Aurora Equip. Co., 909 N.E.2d 931, 938 (Ill. App. Ct. 2009)). Van Fossen v. MidAmerican Energy Co. , 777 N.W.2d 689, 698-99 (Iowa 2009). Mr. Van Fossen, who worked as an independent contractor at power plants from 1973 to 1981, alleged his wife who had died of mesothelioma was exposed to asbestos from his work clothes. The Iowa Supreme Court held that employers of contractors owed no general duty of reasonable care for policy reasons and did not examine foreseeability. “If employers of independent contractors were to bear an unlimited general duty to exercise reasonable care … the universe of potential persons to whom the duty might be owed is unlimited,” the court wrote. Georgia Pacific, LLC v. Farrar, 69 A.3d 1028 (Md. 2013). The Maryland Court of Appeals overturned the appellate court’s affirmance of a $5 million verdict for the granddaughter of a construction worker who claimed exposure to her grandfather’s work clothes who worked near other workers using joint compound in 1968 to 1969. The court examined the information available about household exposures to asbestos in the 1960s and 1970s. It then found that even if Georgia-Pacific should have foreseen in 1968-69 that household members were “in the zone of danger, there was no practical way that any warning given by it to any of the suggested intermediaries would or could have avoided that danger.” The court ruled the product manufacturer did not owe a duty to the plaintiff. See also: Estate of Schatz v. John Grane, Inc., 239 Md. App. 211, 196 A.3d 74 (2018). Adams v. Owens-Illinois, Inc., 705 A.2d 58 (Md. Ct. Spec. App. 1998). In a decision addressing several plaintiffs’ matters, Mrs. Wild claimed her asbestosis was caused from handling and washing her husband’s clothing from his work at Bethlehem Steel. Focusing only on the relationship between the parties, the appellate court upheld the defense verdict stating: [I]f liability for exposure to asbestos could be premised on Mary Wild’s handling of her husband’s clothing, presumably Bethlehem would owe a duty to others who came in closed contact with [Mr. Wild] including other family members, automobile passengers, and co-workers.” Bethlehem owed no duty to strangers based upon providing a safe workplace for employees. Miller v. Ford Motor Co., (In re Certified Question), 740 N.W.2d 206 (Mich. 2007). Representatives of the estate of Mrs. Carolyn Miller, alleged she developed mesothelioma from washing her stepfather’s clothes who worked at Ford facilities in Michigan from 1954 to 1965. In an opinion to address a question certified from a Texas appellate court, the Michigan Supreme Court analyzed the foreseeability aspect, and found that the risk of “take home” asbestos exposure was not foreseeable by Ford from 1954 to 1965. Also, examining the relationship issue, the court stated “imposing a duty on a landowner to anybody who comes into contact with somebody who has been on the landowner’s property,” … “would create a potentially limitless pool of plaintiffs.” Lastly, the court declined to find a duty existed under the inherently dangerous activity doctrine. Holdampf v. A.C.&S., Inc. (In re N.Y.C. Asbestos Litig. ), 840 N.E.2d 115 (N.Y. 2005). Elizabeth Holdampf, who was diagnosed with mesothelioma, washed her husband’s clothes from 1971 to the 1990s who worked with asbestos at the Port Authority of New York. Holding that foreseeability does not define duty, it merely determines the scope of the duty once it is determined to exist, the court refused to “upset" the "long-settled common-law notions of an employer's and landowner's duties" to include members of an employee's household. Palmer v. 999 Quebec, Inc. , 2016 N.D. 17 (Jan. 14, 2016). Plaintiff’s decedent, who died of mesothelioma, claimed exposure to asbestos from decedent’s father’s work clothes who worked for an asbestos insulation supplier/installer. The trial court granted summary judgment for the supplier/installer holding there was no special relationship between the decedent and the supplier/installer, and the supplier/installer did not manufacture any of the asbestos-containing products it supplied and installed. The North Dakota Supreme Court upheld the summary judgment holding there was no evidence to establish either a special relationship between the supplier/installer and the decedent, or the supplier/installer’s knowledge of the dangers of asbestos while decedent’s father was employed by the supplier/installer. There was no evidence from which a reasonable person could conclude the supplier/installer owed the decedent a duty of care, the court ruled. Boley v. Goodyear Tire & Rubber Co. , 929 N.E.2d 448 (Ohio 2010). Mary Adams claimed her mesothelioma was caused by asbestos from her husband’s work clothes, who worked at Goodyear from 1973 to 1983 as a pipefitter. The Ohio Supreme Court upheld summary judgment for Goodyear because under an Ohio statute, R.C. § 2307.941(A)(1), a "premises owner is not liable in tort for claims arising from asbestos exposure originating from asbestos on the owner's property, unless the exposure occurred at the owner's property." Code Ann. § 2307.941(a)(1) – See also discussion of Boley decision above.